Follow trails through the striking Tramuntana Mountains that separate the beautiful north-west coast of Mallorca from the rest of the island. Walk between picturesque villages, along coastal cliffs and through orchards of orange, almond and olive trees. Relax on pretty beaches - Sample local Mallorcan cuisine in quaint village cafes. Your walking holiday starts in Valldemossa, a pretty, small town built around an old 14th century Carthusian monastery, with cobbled streets in the centre and beautiful views down to the Mediterranean. Set in the Tramuntana Mountains the town is surrounded by forested hills and rolling countryside, and is a great base for exploring. The narrow streets are also home to cafés and bakeries offering local fare. Many artists have found inspiration here including the composer Chopin. Valldemossa is your base for the first two nights - Our preferred hotel of choice is a small, centrally located hotel. Your first walk is a famous circular route known as the 'Archdukes Trail'. This was originally a mule path part designed by Archduke Ludwig Salvador of Austria, a keen botanist and geologist who owned the local estate in the 19th century. As you walk through the countryside this path offers some insight into rural life including lime kilns and charcoal stoves, as well as stunning coastal views. Your walk today covers 15 kilometres over approximately five-and-a-half hours, with a total ascent and descent of +500m / -500m. If you wish it is possible to shorten or extend the walk, including the opportunity to climb Puig Es Teix (1064m). The picturesque coastal village of Deia village is a short taxi ride away (included). Today's walk starts at Deia village, Deia beach or Llucalcari bus stop depending on how far you wish to walk. Your destination is Port Soller, thought by many to be one of the most beautiful bays on the island. The trail follows the coastline through quiet Mediterranean woodland of pines, oaks and strawberry trees; and a private estate where in season fresh orange juice is often served. On arrival you can start to explore Port de Soller, your base for the next four nights - Our preferred hotel of choice is located close to the beach. Today's walk covers 14 kilometres over approximately five and a half hours, with a total ascent and descent of +200m/ -440m. The walk today is through the very heart of the Serra de Tramuntana. After a twenty minute taxi drive up to Cuber Lake (included) you will follow a wide path along the reservoir to Col de l'Ofre (885m). This is an excellent place to see birds of prey, such as black vultures which can often be seen overhead. From here it is possible to extent the walk to climb to the summit, Puig de l'Ofre (1095m) before a spectacular 800m descent through a narrow gorge down to the hill village of Biniaraix, famous for its orange groves. From here we take a taxi (also included) back to Port Soller. This walk is part of the pilgrimage route from Lluc Monastery and offers stunning scenery throughout the descent. The walk from Lake Cuber to Binairaix is 11 kilometres and takes approximately five hours. The total ascent and descent is +150m / -800m. It is possible to extend this by climbing Puig del'Ofre (1095m). This circular walk starts in the port and climbs steeply to the cliffs which form a natural breakwater overlooking the bay. From Torra Picada, a 17th century watchtower, there are great views along the rocky coastline to the tiny island of S'Illeta just off shore. A steep descent along a ravine takes you to 'Sa Punta Llarga', a headland which also gives great coastal views, before returning back to Port Soller. For your last walk you are taken by taxi to Cala Tuent, a small village with a lovely beach. From here you first follow the coastline, then hike inland through orange groves and olive orchards through one of the most remote valleys of Mallorca. On arriving to Soller there is the opportunity to explore the historic town. Built inland to try to avoid pirates, the town grew wealthy from olive and citrus fruit trade and today has a relaxing café culture. A vintage tram (not included) runs between Soller and Port Soller. Today's walk covers 15 kilometres and takes approximately five and a half hours. The total ascent and descent is +550m / -700m. Your trip ends today after breakfast, in Port Soller. Palma airport is served by low cost carriers (EasyJet, Ryan Air), charter / schedule airlines (including Monarch, Thomson Airways, Fly Thomas Cook) direct from many UK airports. Your trip starts in Valldemossa. A taxi from the airport to Plaça de Espanya will cost approximately 25€. The bus to Valldemossa is Line 210 and runs from Palma to Port de Soller with stops in Deia and Valldemossa. (Note - This is not the direct bus to Soller and Port de Soller). 01 May to 31 October - Buses run daily at 7.30, 10.15, 12.00, 16.15 and 19.30hrs. 01 November to 30 April - Buses run: Monday to Friday every two hours from 07.30 to 19.30hrs; Saturdays at 07.30, 09.30 and 19.30; and Sundays: 08.30, 09.30, 12.00 and 19.30. It is a short walk from the bus stop to our hotels Hotel Ca's Papa and Es Petit Hotel de Valldemossa. Hotel Casa de C'as Garriguer is about three kilometres away so you may wish to get a taxi. Please note it is possible to pre-book an airport transfer from Palma de Mallorca Airport. Please contact Explore at least two weeks prior to your holiday to arrange this. There is a public bus (Line 1) from Transmediterranea Terminal to Palma bus station. From there you can travel on by bus to Valldemossa as above. A taxi from the ferry terminal to Valldemossa is approximately 45€. There is a public bus from Port Soller to Palma (Line 211). This runs several times a day, with slightly fewer services on weekends and holidays. The journey is about 40 minutes and costs 3€. A taxi from Palma city centre to the airport costs approximately 25€. Please note it is possible to pre-book a transfer from Port Soller to Palma de Mallorca airport. Please contact Explore at least two weeks prior to your holiday to arrange this. 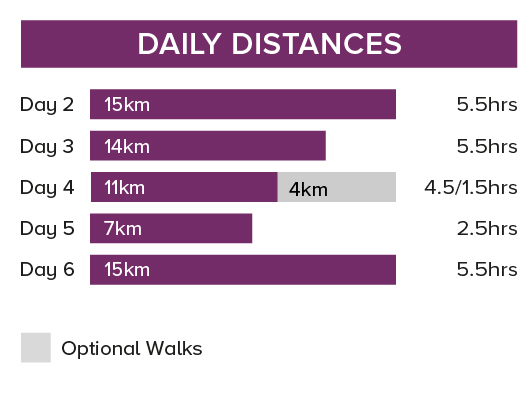 Walks on 5 days for an average of 4.5 hours a day, mainly on unsurfaced trails and footpaths. The total distance covered 61 kilometres, though it is possible to extend some of the walks. The maximum daily total ascent and descent on the standard walks is +550m / - 700m. Sat 23 Mar 2019 - Mon 30 Sep 2019 Your trip can depart anytime between the above dates. Contact us for triple room requests and solo traveller prices. Fri 1 Nov 2019 - Mon 25 Nov 2019 Your trip can depart anytime between the above dates. Contact us for triple room requests and solo traveller prices. Sun 1 Mar 2020 - Mon 23 Mar 2020 Your trip can depart anytime between the above dates. Contact us for triple room requests and solo traveller prices. Tue 24 Mar 2020 - Tue 31 Mar 2020 Your trip can depart anytime between the above dates. Contact us for triple room requests and solo traveller prices. Fri 1 May 2020 - Fri 31 Jul 2020 Your trip can depart anytime between the above dates. Contact us for triple room requests and solo traveller prices. Sat 1 Aug 2020 - Wed 30 Sep 2020 Your trip can depart anytime between the above dates. Contact us for triple room requests and solo traveller prices. Sun 1 Nov 2020 - Fri 20 Nov 2020 Your trip can depart anytime between the above dates. Contact us for triple room requests and solo traveller prices.